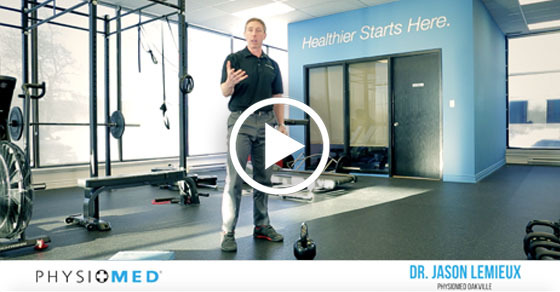 Hi, I'm Dr. Scott Wilson, founder and chairman of Physiomed! Today we're going to talk about the importance of working out our legs. We've all heard about the importance of core strength, but did you know that lower body strength is key to maintaining a well-rounded physique? Here with me today is doctor Jason Lemieux, from Physiomesh Oakville. He's gonna walk us through an effective leg workout and explain why skipping legs is a big mistake. Hi, I'm doctor Jason Lemieux from Physiomed Oakville. A lot of people put off training their legs. Most people just hate leg day probably because training your legs is really hard and can leave you pretty sore for a few days. We can't overstate the importance of leg exercises and training your lower body. In 2010 there was a study in the British Medical Journal that showed single leg balance time and lower body power are actually associated with longevity. So not training your legs is a big mistake because it can impact your entire life. Now, if we were to look at the average commercial gym, we'll see a lot of people will go in and the average leg workout probably looks like leg press, leg extension, hamstring curl, calf raise. That's fine. It's better than not training our legs, but that's essentially a strict muscle only workout. That's kind of a bodybuilder workout. We want to try to take a little more of a movement pattern emphasis when we're training legs because I don't just want to get good at exercise. I need my exercises to make me better at life to help prevent injuries and extend by longevity. So we're going to break up leg workouts into three main exercises. Your lower body as a human being essentially squats, deadlifts and lunges in real life. When we look at a squatting motion pattern, it's essentially how the human body sits. If you go to any non-industrialized country in the world, you're going to find senior citizens that can, with their heels on the ground, sit into a full squat for a prolonged period of time. In North America, we're used to sitting with our hips and our knees at 90 degrees and we get robbed of that range of motion. So squatting and the gym is not just about being able to become better at the exercise. It's about being able to become better at that fundamental movement pattern of sitting. Deadlifting has a pretty ominous sound to it. It can put a lot of people off because it sounds like a dangerous exercise. But deadlifting is one of the most fundamental movements we can have as a human being. We can even just refer to it simply as hip hinge. In a deadlift, I'm going to essentially stabilize my spine as I hinge from my hips to lift an implement from the floor. Whether it's a kettle bell, a dumbbell, or a barbell, that motion is incredibly important. I load my posterior chain my hamstrings and my glutes and it adds stability to my spine if performed properly. The reason that that's so important is we pick stuff up for our entire life. So that movement pattern of deadlifting this kettle bell and demonstrating good spinal control should be essentially the same movement pattern I demonstrate when I pick up my phone or my keys. And we'll often see people that come into the clinic with acute low back pain. And when we ask them what did they do, the answer is nothing. And nothing's usually followed up by, I just bent over to pick up a pen or they did nothing. Something very innocent. And we can almost guarantee that that motion was very little hip mobility and lots of movement from their spine, which triggered the low back pain. Now that person may be able to perform a correct deadlift, but they haven't made the link to why that exercise should be used in the rest of their life. And we finally come to the lunge. The lunge is the human body's way that it interacts with the ground. So if I'm actually gonna come to sit on the ground or lay on the ground to perform an exercise or do some gardening, lunging is the most efficient way for me to come up and down. We’ll oftentimes see people pick the wrong movement pattern for that action and they will squat their way all the way to the ground. Now. Can you do that? I just demonstrated it, but we'll see that that's a very knee dominant motion and a lot of our patients will come in with knee pain as a result of it. So if we can get better at the exercise and use that in real life to lunge are way up and down from the ground, we're going to have stronger legs, which might help improve our longevity, and we're going to be less likely to get hurt.